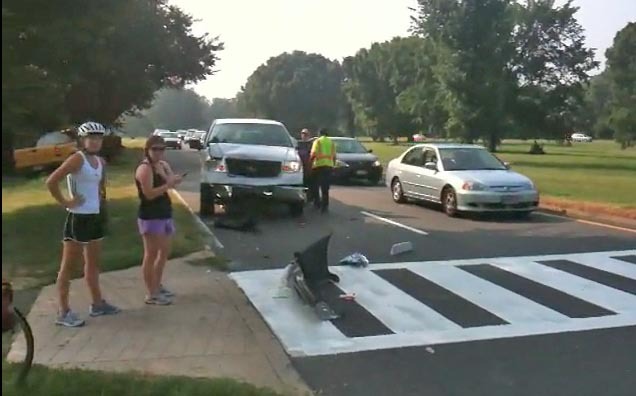 A three-car accident on the GW Parkway this morning could have been much more serious had a cyclist not hesitated at a pedestrian crossing. Two injuries were reported after a pickup truck rear-ended at least one of two cars that had stopped at the crossing. According to a video posted on Facebook by a witness, the female cyclist hesitated before crossing in front of the two cars. That act of vigilance may have saved her life. “I wonder when or if the NPS will figure out how to reduce accidents there,” another witness told ARLnow.com, in an email. The two injuries reported by medics on the scene were both said to be vehicle occupants. U.S. Park Police and Arlington County Fire Department spokesmen did not have any additional information about the accident.